Though the sun had already dipped below the horizon, last night I cleaved a rather large harvest of "rainbow" hot peppers before moving on to the habanero and japaleno plants with a deftness and precision that would make a ninja look like a hack. 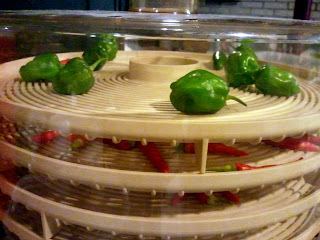 I left my victims screaming silently in the twilight as I scurried the produce indoors to await its date with destiny in the food dehydrator. A boisterous round of slightly maniacal laughter emanated unintentionally as I sacrificed my vegetative victims to the Gods of Food Dehydration. Somehow, during all the craziness of the dancing and what with the whooping it up and all, I managed to get a few pics of the victims after they'd been interned to their well-ventilated graves! Click here to feast your eyes on the whole gallery! Some Dogs Love Their Veggies! Peake-n-Stine's 5th Annual 30th B-Day Bash!!!! BFC Night!! --- Teriyaki Glazed Chicken!